As noted here, iG is in the process of recruiting a second squad to their Dota2 section. 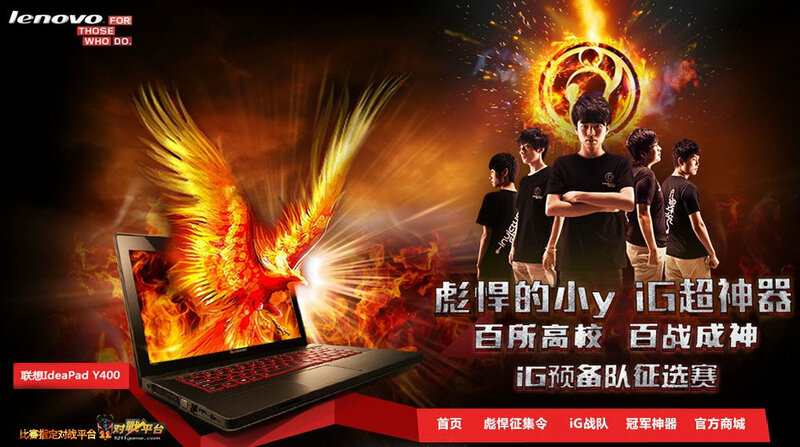 This is a nation-wide recruitment effort sponsored and in partnership with Lenovo, promoting the Y-series gaming laptop. Lenovo is also providing an overall cash prize pool of over 35000 RMB (over 5000 USD) to top teams. According to this, signups ended on Dec 19, 2012, and the online portion of competition took place from Dec 20 to Dec 30, 2012. The top 32 produced from this can be seen in brackets here. Next, from matches played in this bracket, iG players and coaches will select a small group of their own favored players and invite them to a ‘Masters Training Series”, taking place from Jan 7 to 9, 2013. During these three days, the selected players will be trained and coached by iG players and coaches for the next and final stage. Lastly, iG Dota2’s current team will meet with a final group and hand-pick ten players, who will be invited to the “Lenovo Y-series iG New Year party”, on Jan 9, 2013, where they will face off against each other and the winning team of 5 players will officially win the title of “Y-series iG reserve team”, earning the right to represent iG club in future competitions, as well as taking home cash prizes. For all the detailed rules and regulations, go here. Just like the 242-team university tournament that recently ended, this series is also using Dota 6.74c. It seems like as much of a promotional/marketing effort with Lenovo as it is anything, but iG’s members are making the rounds around China for this, so you never know. It looks like this will produce a ‘backup team’ of sorts, doesn’t look like it’ll be something like LGD.int, but who knows what it may become.